Rescheduled to Wed Feb 27th! 6-8 PM!! 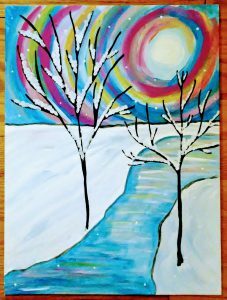 Join us on Feb 20th 6-8 PM for a WINTER themed paint party! This class is easy enough for the most inexperienced artist! The cost is $25 per person and includes all supplies and a delicious cookie and coffee bar graciously provided by The Bistro! Come join us for this fun event!